(Howls for Holly Project) Wolves were not slaves to their riders. They had their own free wills � and their own concerns separate from the cares of elves. They caught the branch-horns in the lowlands near the shore of Stoneback Lake. New spring grass was growing lush there, and the tall, white-rumped creatures were already beginning to put weight back on after the hard winter. The large herd stood its ground for a moment as first Blacksnake and Wasp rode down out of the treeline above them. Then the rest of the hunting party followed, and the herd came apart like a puff-ball. Wasp soared down the grassy slope, his attention already focused on a single animal amid that fleeing scrum. The rest of the hunters followed � Quick Fang on Growler, Crackle on Muddypaws, Otter on Splash, a riderless Frostback and Murkfur, and a wolf who had accompanied the hunters without his rider � Halfmoon. Blacksnake needed but a moment to see why Wasp had singled the one branch-horn out from the others: while it was a big male in its prime years, the creature had a hesitation in its stride. One of its fore-legs was straining at full extension � a ligament injury or perhaps a bruised hock. The limp was just enough to mark it as likely prey, and leave it laboring to match the pace of its fellows. The big stag jigged and jagged, knowing its danger. When it was clear it could not reach the far edge of the meadow before the wolves could surround it, the wily stag abruptly changed course and raced for the lake itself. That was its best chance � to immerse itself and outswim its pursuers. But old Wasp was running full out, with the rest of the pack streaming in a line behind him. An unridden wolf would try to edge ahead of the stag if possible, to herd it off course or else lunge for its throat or nose. But Wasp and Blacksnake had been a pairing for many long years, and Blacksnake did not even need to visualize a wolf-send to the old pack leader for Wasp to know what was needed. Wasp put on a final burst of speed, managing to draw up alongside the stag. It was the perfect positioning for a broadside strike. Blacksnake drove his spear home, knowing his weapon's placement was too high to clip its heart, but that it would certainly pierce both of its lungs for a good, clean kill. Mortally wounded, the branch-horn bull staggered and bawled, splattering wolf and rider alike with the frothy explosion of blood from both its nose and mouth. Wasp fell back, wise enough to recognize the kill had just been made. The stag itself managed another half dozen strides before it went down just a few spear-lengths from the waterline, choking on its own blood as its lung-sacks collapsed. Blacksnake scrambled from Wasp's back and drew his obsidian knife, careful of the stag's thrashing legs as he cut its juglar to hasten its end, even as his panting companions all drew to a stop around the kill. Young Crackle and Otter were both grinning and jittery with adrenaline from the chase. Quick Fang howled, and the two youngsters joined in, followed by the wolves. Blacksnake and Wasp were last to join their voices to that victorious chorus � Blacksnake because he was jerking his spear free from between the branch-horn's ribs, and Wasp because that was the old wolf's way � he knew his pack-kin were awaiting their leader's vocal affirmation, and he made them wait several long heartbeats before he granted it. When the howl ended, the elves set to work. If the elves had not been hunting with them, the wolves would have immediately set to feeding. But the elves restrained their companions from that hard-won meal now � they needed the branch-horn's hide and its offal, as well as choice cuts of the meat. **Wait,** Blacksnake sent firmly to Wasp, pressing his old partner with the images of the wolves all sitting patiently while the elves hurried to finish, with much good venison left when they had finished. Wasp gave a cranky mutter in response, but he knew his job well enough. He stood between his packmates and the kill and glared, ears canted back and tail stiff, physically blocking their approach to the kill. "Let's hurry," Blacksnake said, getting straight to the bloody work. "Hungry," Quick Fang agreed, speaking for elf and wolf alike. They split the liver between them, rewarding the patience of the wolves with the heart and many of the other organs. The stomach and intestines they pulled aside, to rinse out in the lake and carry home. Berryflop had come along for this trip and was eager to wrap up the meat they would carry home � the backstrap and the hindquarters and some of the brisket would be all the four elves would be able carry home, leaving ample for the wolves to feast upon. "If that bull had reached the lake, we'd have lost it!" Crackle said, working with Otter to lug the heavy intestines down to the water while Blacksnake and Quick Fang efficiently skinned the stag. "I'd have been able to swim after it and catch up!" Otter said. "I'd have just swum right up to it and cut its throat!" Blacksnake snorted at the youthful boast; he slid a glance at Quick Fang, and saw her roll of the eyes. It was the type of stunt she might well have tried herself once, not all too long ago, he thought with some amusement � and with appreciation as well. Motherhood had matured his tribemate more than Blacksnake had expected it might. "And then what would you have done?" Crackle laughed, elbowing Otter in the ribs. "It would have died and sunk to the bottom like a rock!" Otter made a face as he considered that. "We could braid some ropes out of Preserver spit, and drag it to shore," he offered then. "The wolves would never forgive you for losing their dinner like that!" Crackle continued to laugh. There was a snarl and a snap, as if in punctuation to her words. Halfmoon had stood and pressed forward toward the gutted branch-horn, only to be met by Wasp's fierce correction. Riderless Murkfur and Frostback had accompanied the hunters when they had left the Dentrees that morning; Halfmoon had joined them shortly after they had passed through the thornwall's northern gap. Blacksnake had immediately cast out a sending, and found Nightstorm on duty nearby, guarding over Halfmoon's rider Evervale as the plantshaper was sunk in a deep shaper-trance as she reinforced a section of the stout thornwall. Blacksnake would have preferred Halfmoon to stay with Evervale as she went about her work on the thornwall, but Nightstorm and her Silverbite would have to prove guardians enough. 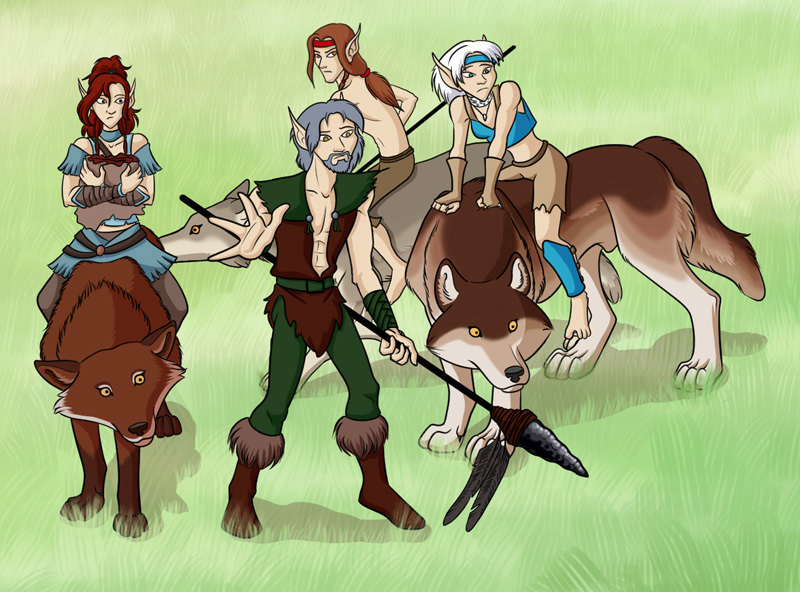 Halfmoon had already bored of his young elf-friend's shaping duties, and wolves were not enslaved to their riders. They were free to travel as they willed. But even knowing that, Blacksnake still gave Halfmoon a narrow-eyed second look. Evervale's wolf-friend had been shadowing Wasp ever since Blacksnake had returned to the Holt from his long trek scouting after the Fierce Ones. Halfmoon had worked his way up to a second-place rank within the pack, and was clearly angling for higher. Wasp was equally aware of the younger wolf's ambitions, and the tension between that pair was palpable. Quick Fang was slicing the branch-horn's hide loose from the skin around its neck. She had intercepted Blacksnake's scowl, and interpreted it correctly. **Halfmoon is angling to become chief-wolf,** she sent gruffly. **Wasp will teach him otherwise, soon enough,** Quick Fang replied, mollifying Blacksnake's discomfort. He knew the winter's long, hard trek north to the steppes had been hard on the old pack leader. He felt in his heart that Wasp had several more good years left to him � but it was a relief to hear Quick Fang's opinion on the matter, as canny as she was about the political shifts within the pack. Blacksnake looked up, even as the wolves rose and turned in unison. Three squat, dark shapes were coming quickly down from the treeline. Blacksnake knew the hunting here around Stoneback Lake well enough to recognize them. It was the amber-shouldered grizzly sow the tribe called Yellowtop, along with her two yearling cubs. The bears would have only come out on their hibernation within the last half-moon, and indeed, they still looked winter-thin. Splash began to whimper, and Murkfur began to back away. 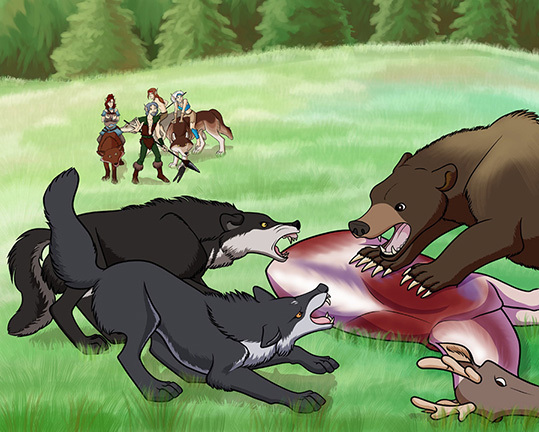 A normal wolfpack without elf-friends would give up its kill to a big bear without a struggle � the danger of injury was simply too high to make a fight worth it. The Holt's pack sometimes stood its ground, if there were armed elves enough to tip the scales. Today, with Quick Fang and the tribe's two youngest hunters flanking him, Blacksnake knew that had there been only one hungry bear approaching, his decision might have been hard to make. But instead, there were three bears � and that made it an easy call for the Hunt Leader to make. Even with two of those half-grown yearlings, it was three bears too many. Blacksnake ripped the stag's hide loose and rolled it into a bundle. "Get your weapons," he ordered his companions. "Move out!" "What?" Otter cried in outrage. "We're just going to give up our kill?" **"Carry that! "** Blacksnake ordered in words and sending alike as he shoved the raw, heavy hide into Otter's arms. The youth would have to drop the burden and disobey his elder in order to reach after the bow slung across his back � and the notion of that rebellion was still racing through his eyes uncommitted when Quick Fang shoved the Otter toward his wolf. "Go! Hungry bears are angry bears!" she urged. "Not worth the fight!" "We can make another kill," Blacksnake agreed, relieved the silver-maned huntress was being sensible � as the story of her Recognition to his half-brother Suddendusk went, Quick Fang had not always been so reasonable about matters of stolen prey. "Go," he ordered, snatching up his spear and waving to his niece Crackle to drop the half-rinsed stomach she was burdened with. She delayed for only a moment, looking at the approaching bears. All three were running in their rolling, deceptively comical gait � which meant they would be on top of the downed stag in only moments. Crackle dropped what she was doing and ran, with Blacksnake at her heels. Murkfur and Splash were only too happy to retreat, so much so that Otter had to run to match Splash's stride to get astride his she-wolf. But neither Halfmoon or Wasp were as willing, their rivalry bolstering their recklessness, and Growler, Frostback, Murkfur, and Muddypaws all hung back as well, waiting on their pack leader. **With me! ** Blacksnake ordered firmly, willing his wolf-friend to give up the kill. He pictured them together, racing down another stag � this one fatter, juicier, leaving a winter-scrawny kill behind for the bears. Wasp dismissed that command with a fierce wave of possession. This kill was his � as were these members of the pack. His meal. His pack. Then the she-bear and her yearling cubs were there, arriving with all of the thunder and fury of an avalanche. Yellowtop wasn't the biggest grizzly bear in the Holt's territory, but there was plenty enough of her to go around, and she was keenly hungry. She slammed herself down across the body of the kill and roared a challenge at the small pack of wolves, while her two offspring rumbled up behind her. One of the pair rose up on its hind legs in challenge, while the other loped several strides past its dam, scattering the dithering wolves before it. **With us! Now! ** Blacksnake sent again, letting his fear make the open wolf-send blaze. He felt Quick Fang's firm reinforcement of that command join his own, willing Wasp and Halfmoon both away from this confrontation. But wolves were not slaves to their riders. They had their own free wills � and their own concerns separate from the cares of elves. Halfmoon was not retreating, so therefore, Wasp refused as well � or was it vice versa? Blacksnake could feel the flat denial in his wolf-friend's mind, along with a fierce rage at being challenged in any fashion. Halfmoon lunged for the yearling, nipping at its flank. The yearling spun and swatted after the wolf, but Halfmoon had already darted away. Wasp sprang at it from the other side, snapping and snarling. It batted at Wasp, but the old wolf was already leaping clear, distracting its attention from Halfmoon. The younger wolf surged in and ripped a mouthful of fur from its flank. The yearling bear cub bawled in pain. **No! ** Blacksnake sent in protest, even as he felt Crackle's hand close on his arm. At her cub's cry of pain, Yellowtop exploded. She launched to her youngster' defense, a boulder-sized flowing dark mass of fur, fangs, and murderous fury. Halfmoon melted away on the retreat � but Wasp was closer to the she-bear, and not as quick to get away. Blacksnake saw the pack leader disappear beneath the she-bear's surging claws; he felt a shocking blaze of pain and fear through Wasp's mind-touch, and then his wolf-friend's awareness was snuffed out like a candle flame. Halfmoon was running for his life, tail tucked and ears flat. Yellowtop was still following him, intent on punishing anything and anyone reckless enough to mess with her offspring. Blacksnake caught a glimpse of Wasp's broken body as he turned away, shoving Crackle for her wolf. He saw her astride as Halfmoon flashed past them both; then Quick Fang was there, offering him a hand. He vaulted astride Growler behind her, and Growler ran after the rest of the fleeing hunting party, carrying both riders safely out of range of the she-bear's rage. They reached the treeline before stopping again. Once the pack had been run off, Yellowtop and her cubs had not followed. They were now enjoying the spoils of their victory. Blacksnake slid from Growler's back. He stood among the fringe of trees and looked down. Wasp's lifeless body lay in the trampled-down grass below, ignored for now by the bears. There could be no question about it � the old pack leader was dead. The suddenness of the loss staggered him. Wasp wasn't the first wolf-friend Blacksnake had lost during a hunt � or lost to combat, either. But the shock of it was still numbing. The rest of the hunting party � wolf and elf alike � seemed equally stunned. "I can't believe it," Crackle finally said. "Not Wasp! What are we going to do?" "Nothing to do," Quick Fang muttered. "Dead is dead." "We've got to go down there and get payback!" Otter said. He finally dropped the heavy branch-horn hide and pulled his bow. "Let's go and get them!" While there was a part of his heart that agreed with the youth's desire for revenge, Blacksnake turned and fixed Otter with a sharp look. "We're doing no such thing," he said firmly. "But they killed Wasp! Our pack leader!" Otter cried. "We can't let them go unpunished! I killed a bear before with only one arrow! I can do it again, I know it!" Crackle made a rude sound at that boast, while Quick Fang was growling under her breath. "The bears do what bears do," the huntress said. "Bears steal kills. Wolves who stand and fight get hurt. Or worse." "Wasp knew the danger," Blacksnake agreed, although it hurt his heart to say the words. "And Wasp made his choice. I'm not putting either of you two yearlings in danger looking for misguided vengeance. Instead � take this for a lesson. A bitter one. When a bear wants something you've got, give it up. It's not worth your life � or your wolf-friend's � to contest the matter." "I could take down at least two of them," Otter muttered, still glaring fiercely down toward the feeding grizzlies below them. "I know I could." "Then you'd be stupid," Quick Fang scowled. "Lot of meat on a bear. You'd waste it all, killing for no good reason." Otter was still scowling, but his rebellion was fading fast. Crackle was watching Blacksnake, waiting to see what her uncle chose to do next. Blacksnake met her grieving eyes and held them. He felt the silent brush of her mind-touch, offering grief and sympathy in equal measure. It was a gentle gesture that reminded him at once of Crackle's mother, Windsong. Blacksnake looked down toward the lakeshore again, where Wasp's body lay in the trampled grass. The bears would not leave their meal again until either they had reduced the stag to bones, or buried it. If they cached it, they'd likely cache Wasp's corpse as well. Wolf-meat wasn't high on a bear's list of favorites, but no bear only weeks out of hibernation was very delicate about what it scavenged for a meal. "Wasp made his choice," Blacksnake repeated, having a bitter decision now of his own. It wasn't easy to turn his back on the sight of his dead wolf-friend's carcass, but there was no bringing back the deceased � and the Hunt Leader knew he had the tribe's two youngest hunters learning from his example. "The branch-horn herd is still nearby," he ordered. "It won't take us long to track them down. So let's get after them before they've bedded down for the night." There was no disagreement to the Hunt Leader's command. Young Frostback was already familiar with Blacksnake, having carried him on and off-again during the long trek north after the Fierce Ones that winter. Frostback nuzzled up to him now in cautious invitation, while Halfmoon put himself ahead of the rest of the gathered wolves. When Growler snapped at him, Halfmoon snarled and attacked the older wolf in a flurry, until Growler turned away in submission. When Blacksnake rode forward again to search out the first sign of the scattered branch-horn herd, Halfmoon pressed ahead of Frostback, having no hesitation to assume the pack leader's position at point. Blacksnake understood ambition. He could not fault Halfmoon for it. Halfmoon was simply being true to his own wolfish nature, as true as Wasp has been. No matter that sometimes, that wolf-truth could prove to cruel to elven hearts. If any of his companions saw the tears that slid down Blacksnake�s face now, as they rode away from Stoneback Lake to resume the hunt, no one said a thing.